We buy trampolines for lots of reasons. Maybe we want the benefits of some full-body exercise. Maybe we need a way for the kids to burn energy while we get some work done. But let’s be honest with ourselves: at the end of the day, trampolines are fun because they’re bouncy. That’s why today we’re ignoring all the other stuff and selecting the top 5 bounciest trampolines available in 2019. We’ll answer all your questions relating to high bounce trampolines and help you find the product that will be the most fun for your and/or your children. As a disclaimer: it’s difficult to say exactly how high you’ll bounce on a given trampoline since it depends on the wind, your weight, and other factors that are hard to control. However, we’ve tested all these trampolines ourselves and can confirm that they are among the bounciest trampolines for sale, and we’ve checked with other review sites to confirm which trampolines are most likely to give you the most bounce for your buck. Obviously, the main factor we looked at when compiling this list was bounce height, but we considered other factors as well, as we’ll describe in each review. Whether you want to buy a trampoline for yourself or for your children, these high bouncing trampolines are sure to please! The AlleyOOP Double Bounce is frequently cited as one of the bounciest trampolines ever. There’s two elements that contribute to the bounciness of this trampoline. The first is the high performance springs, built out of music wire and engineered specifically for maximum stretch (which translates to maximum bounce.) And the second is the feature for which this trampoline is named: the “double bounce” two mat system. Most trampolines have a single mat – that’s the part that you bounce on. The Double Bounce has a secondary trampoline mat that traps air between to the two surfaces and acts like a giant air pillow that lets you jump as high or as soft as you want. The Double Bounce isn’t just one of the bounciest trampolines around – it’s also one of the safest. It has an impressive maximum weight of 295 pounds, so it can be used by children and by most adults. Finally, the two mats act as a cushion, so that even when you jump a lot higher than you might on another trampoline you’ll still land safely and gently. These features are what really pushes the Double Bounce over the edge. It’s expensive, for sure, with a price tag of $2,099 at time of writing, but it’s well worth the price if you want to buy the best, bounciest trampoline for sale. Spring count is kind of a myth. Yes, more springs translates to a higher bounce, but the length of the spring is the more important consideration. 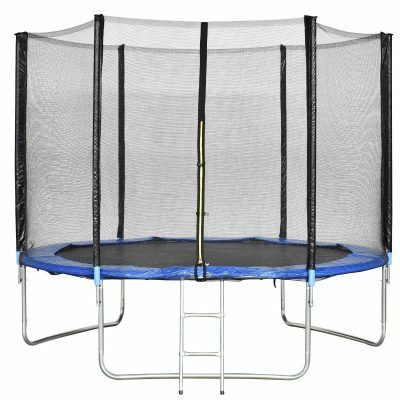 Most trampolines that promise to have lots of springs only do so because the springs are really short, leading to a shorter bounce overall. To make an appreciable difference, you’d have to include a ridiculous number of springs. That’s exactly what Skywalker Trampolines has done with the Jump N’ Dunk. It’s not just the name that’s ridiculous – this trampoline has ninety-six 7-inch springs coiled around the outside of the enclosure net, making it one of the world’s bounciest trampolines just by sheer force of construction. The Jump N’ Dunk lacks some of the cool high-tech features of the Double Bounce, but it’s still very safe, fully enclosed, and has foam padding on the poles so that children won’t hurt themselves while bouncing. And this is primarily a trampoline for kids – it even comes with a basketball hoop and two foam basketballs for outdoor fun and games. And it comes in six different styles, including a hot pink option (my personal favorite) and another where the pads have a camo pattern, as though any amount of camouflage could hide the enormous noisy trampoline you have in your backyard. Another feature that will probably make this a better choice than the Double Bounce for most of our readership is the fact that it’s much cheaper at only $329.99 USD. Except for the camo pattern, which – I kid you not – is $10 more expensive for some reason. Ignoring that, this is still one of the finest high bounce trampolines available on the market today. The Kinetic Trampolines brand K12-6BE trampoline isn’t exactly a name that rolls off the tongue, but this is an excellent high bounce trampoline for children and adults (the weight limit is 250 pounds.) 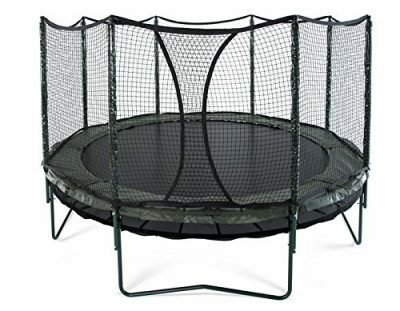 It has 72 springs (which is a lot for most trampolines but does pale in comparison to the Jump N’ Dunk) and will regularly allow you to bounce as high as 6 feet in the air. 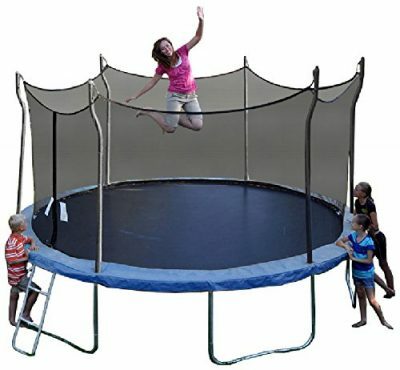 Fortunately, it comes with a large sealed enclosure with padded poles, and this durable trampoline can take a lot of punishment, so you don’t need to worry about you or your children getting hurt on this high bounce trampoline for sale. This is the cheapest trampoline on this list at a very reasonable price of $234.99 USD, but we highly recommend that you consider springing an extra $165 for the expert assembly. Kinetic Trampolines is a trustworthy company and this particular model is very annoying to set up on your own, so this extra cost will provide a lot of value to most buyers. Boy, another name that just looks like gibberish, huh. Propel trampolines are known for their bounciness thanks to their high spring count (the P14D-BE one has 72 springs) and their impact-absorbent design. This trampoline has a great bounce and an extra-strong safety net as well as a 275 pound weight capacity that makes it an excellent choice for bouncers of any age. The P14D-BE is very similar to the K12-6BE we talked about in the last section, but there’s a few small differences. Firstly, the Propel model is $70 more expensive. But that’s because, secondly, it’s a lot easier to set up thanks to Propel’s T-bracket technology that means a lot of the pieces just slide into each other and are more stable once they’re set up. Thirdly, the Propel model is more safe thanks to thicker pads and an enclosure that absorbs the impact of a bounce better, which probably makes it a better choice for active kids. However, the fourth and final difference is that Propel trampolines sometimes aren’t as durable as their competition – they don’t last as long and they can’t take as much of a beating. You know your family better than we do, so you’ll have to decide whether you’re more concerned about damage to the trampoline or damage to the bouncers. 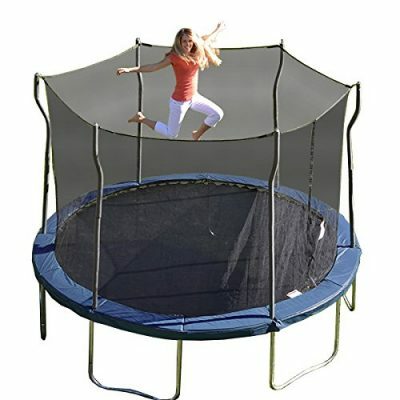 However, either of these trampolines is a great choice if you’re looking for one of the bounciest trampolines for sale. 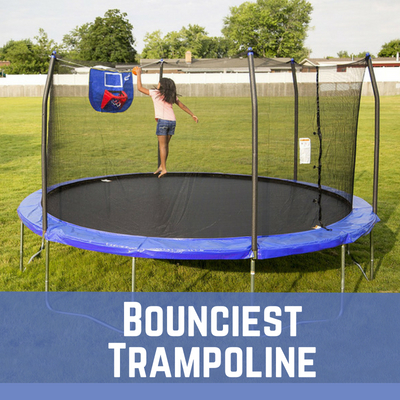 All of the other trampolines on this list are pretty big, but we get it – not everyone can afford to have a really big backyard in this day and age. That’s why we wanted to draw your attention to the Gigantex Trampoline Combo Bounce. This is still one of the bounciest trampolines for sale, as the name implies, thanks in large part to the extra attention paid to the stitched mat. But it won’t reach the heights of the other four options we’ve talked about in this article. However, the Combo Bounce may be a more practical high bounce trampoline for many of our readers because of the fact that it comes in a lot of different sizes – ranging incrementally from 8 feet to 16 feet – instead of a single set size. Another great feature of the Combo Bounce is its 350 pound weight limit, which is quite a bit higher than most trampolines. This means it’s a great high bounce trampoline that can probably accommodate anyone, or even multiple older kids jumping at once! So if you’re looking for a solid high bounce trampoline option that won’t let you down (pun intended), the Gigantex Combo Bounce is a great choice for any family. What is the bounciest trampoline in the world? The bounciest trampolines in the world aren’t available for sale – they’re almost always custom-built. The highest trampoline bounce ever was made on an unnamed trampoline built by three brothers – Sean, Eric, and T.J. Kennedy – who flew more than 22 feet in the air. That’s an awesome record, but it’s also way too dangerous to be made into a consumer product. I mean, I can’t speak for you guys, but in my backyard a 22-foot jump would launch me straight into a power line. And then who would write reviews for all of you lovely readers? What is the bounciest trampoline you can buy? The highest bouncing trampolines for sale is either the AlleyOOP Double Bounce or the Skywalker Jump N’ Dunk, both of which we’ve written more about above. What makes a trampoline bouncy? Two things: the springs and the mat. The springs on a trampoline stretch out and coil back with every jump, and the more they stretch the higher you’ll bounce. Some trampoline enthusiasts try to increase the stretch by crossing the strings over with each other, but we do NOT recommend this method. It does increase the height of your bounces, but it also shortens the life of the springs and may cause them to snap dangerously at a crucial moment. Bounciness doesn’t need to come at the expense of safety! The trampoline mat is the part of the trampoline you actually jump on. Professional-grade gymnast trampolines, which are usually designed to provide the highest possible bounce, are made of incredibly thin woven nylon. But for recreational users like us and most of our readership, you want a mat that’s made of polypropylene fabric. As a general rule, more springs means more bounce. However, the length of each spring matters more than the number of springs in most cases. 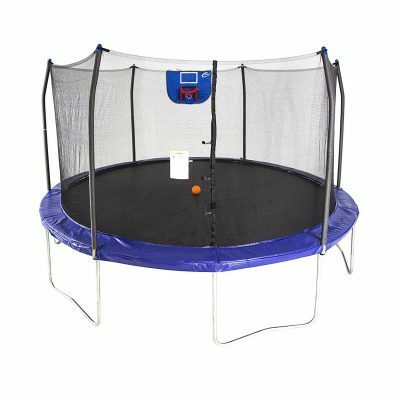 Why would I want a high bounce trampoline? They’re fun! That’s the honest answer – we have different articles for the trampolines that are better for exercise or safety or other important concerns, but sometimes it’s just fun to see how high you can go. Hopefully you’ve learned a lot about the bounciest trampolines for sale and have been able to purchase a great new trampoline for your home. You won’t regret it – trampolines are a great way to work out and high bounce trampolines are a lot of fun for the whole family. But maybe we forgot one of your favorite trampolines, or maybe you had a question that wasn’t covered by our FAQ. If this is the case, be sure to drop us a line in the comments so that we can keep this article up-to-date with the best information available.